Brigitte Stufkens-Geerlings (1959) trained to be a welfare worker, which she became in 1981. From then on she worked for ten years as a social worker. She followed the first Sacred Dance training in the Netherlands. 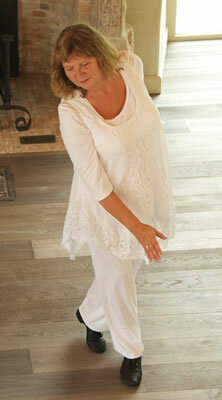 She also has completed a training as dance therapist and aura healer/reader. Since 1984 she has been a Sacred Dance instructor in the Netherlands and abroad. Besides her work as Sacred Dance instructor she also gives courses with her husband Hein.